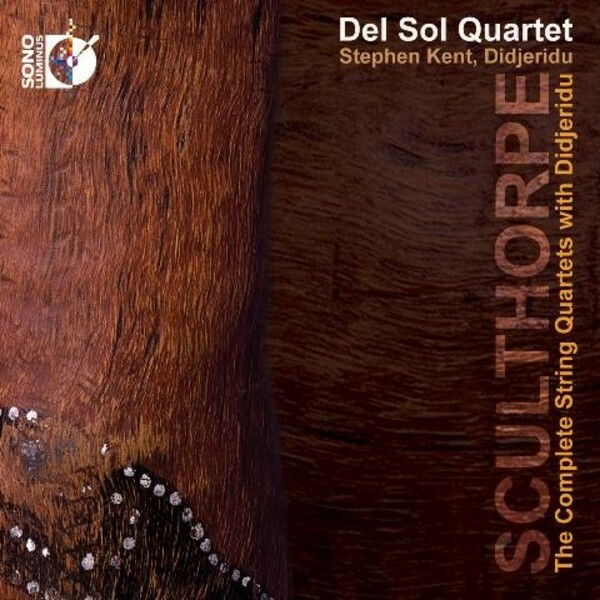 The Del Sol String Quartet teams up with didjeridu virtuoso Stephen Kent to bring to life the Complete String Quartets with Didjeriu by Australian composer Peter Sculthorpe. The result is a unique and exciting aural experience, filled with rich organic sonic colours, brought to life through the use of the traditional quartet and the indigenous sounds of the didjeridu. Charlton Lee of Del Sol says it�s "amongst the amazing artistic collaborations that Del Sol has had in our 22-years of music making�. Born in Launceston in 1929, Peter Sculthorpe was educated at the University of Melbourne and Wadham College, Oxford. He is an Emeritus Professor at the University of Sydney, where he began teaching in 1964. He has been a visiting fellow at Yale University, USA and Sussex University, UK, and has taught at universities within and outside Australia. He holds honorary doctorates from the universities of Tasmania, Sydney, Melbourne, Sussex and Griffith. An Officer of both the Order of Australia and of the British Empire, in 1998 he was elected a National Trust of Australia National Living Treasure. In 2002, he was elected to Foreign Honorary Membership of the American Academy of Arts and Letters. Peter Sculthorpe has written works in most musical forms. His output relates closely to the social and physical climate of Australia, and the cultures of the Pacific Basin. He was influenced by the music of Asia, especially during the 1960s by that of Japan and Indonesia. In recent years he has become more deeply influenced by the Australian Aboriginal and Torres Strait Island music and culture. The San Francisco based Del Sol String Quartet, two-time winner of the top Chamber Music America/ASCAP Award for Adventurous Programming, commissions and performs outstanding new works from around the world, and provides innovative educational programs. The group also collaborates with other artists in multi-media, dance, video and opera productions. Del Sol has commissioned and premiered pieces by composers such as Mason Bates, Kui Dong, Gabriela Lena Frank, Tania Le�n, Keeril Makan, Hyo-shin Na, Ronald Bruce Smith, Chinary Ung and Reza Vali, among many others. Multi-instrumentalist and composer Stephen Kent was born in Britain and spent his formative years in East Africa. Trained on the French horn, he adapted western brass instruments to didjeridu techniques while music director of Australia�s Circus Oz (1981-83). This group�s support for Aboriginal culture led him deeper into Aboriginal land and inspired him to play the didjeridu. Since the mid 1980s, he has pioneered the contemporary use of didjeridu in myriad collaborations with an extraordinary range of musicians, dancers and artists. He has performed all around the world and has a catalogue of over 20 recordings, including 6 solo works and others with groups including Trance Mission, Lights in a Fat City and Baraka Moon. This is the first complete set of these works.